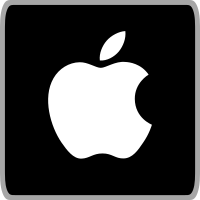 Just a quick post today to share that our oral argument podcasts are now available on iTunes. If you are a user of iTunes, you can easily subscribe to our podcasts by opening iTunes and searching for “Free Law Project” or “oral arguments.” Once you subscribe, the podcasts will download to iTunes wherever you use it. These podcasts contain all of the oral argument audio for a given court or for a search that you create. This means that as of this moment, you can pipe the audio from the Supreme Court and Federal Circuit Courts directly to your pocket with almost no effort. To learn more about creating custom podcasts or about the podcasts that we already have, we’ve created a page on our site with all the details. It also has information about how to subscribe using Google Music, Stitcher Radio, and other apps. We hope you’ll enjoy these podcasts. Who doesn’t want the Supreme Court in their pocket? Iain Carmichael and Michael Kim recently gave a presentation at the PyData Carolinas conference on the topic of Networks and the Law. For their talk they analyzed data from CourtListener, applying a variety of network algorithms to identify important or influential cases. And their slides are available too. What does network science have to say about the law? Can we determine which are the most the most influential cases in our legal system? Can we understand how legal doctrine evolves? Using tools from network statistics and data provided by Court Listener (an open legal data project), we analyze the network of law case citations. Citation networks have recently been a topic of interest to network scientists. Court Listener, an open data initiative, provides the network of law case citations as well as the text of (almost every) court case in the US. This network data set provides a rich array of questions that are of interest to legal scholars as well as network scientists. We are happy to share that as of today, oral argument recordings from the Second Circuit Court of Appeals are finally available on CourtListener.com. This means that you can search these recordings, create email alerts for them, listen to them on our site, and even include them in custom podcasts. Of course, we also provide enhanced versions of these recordings for download, and for developers or researchers they’re also available as bulk data or via our APIs. Before today, we were unable to provide these features for the Second Circuit because they didn’t post their oral argument recordings on their website, so we’re thrilled that they’ve begun doing so. At this point, only the Tenth and Eleventh Circuits do not post their oral argument recordings, but we are hopeful that they will follow the lead of the other circuits and begin doing so soon. 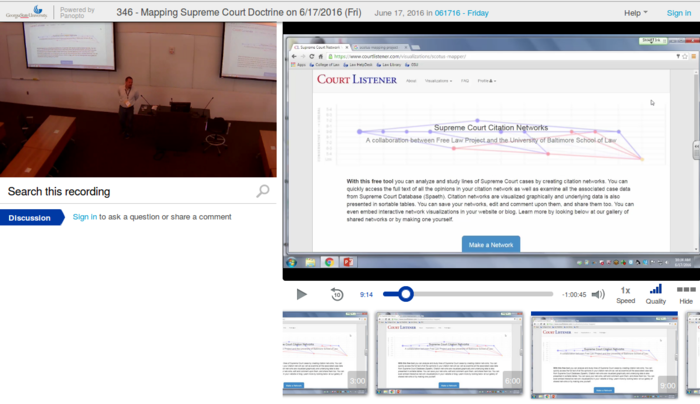 We’re excited to share that as of today, we have added the latest data from the Supreme Court Database (SCDB) into CourtListener. This update adds SCDB ID’s, parallel citations, vote counts, and decision direction data to about 20,000 Supreme Court cases. Each of these enhancements enables some great functionality. For example, now that we have vote counts for older cases, you can create visualizations of older topics, like the “Separate but Equal” doctrine or the Commerce Clause. Colin Starger, the creator of SCOTUS Mapper, has been working with this early data and has created a variety of fascinating historical Supreme Court network graphs. If you want to experiment with this, the place to start is at the SCOTUS visualization homepage. 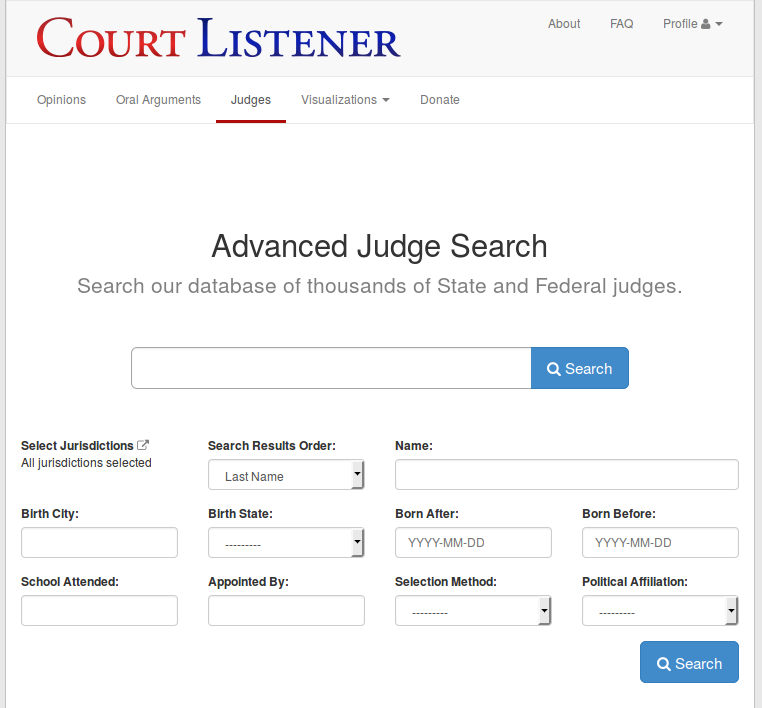 Today we’re launching a new version of CourtListener.com that focuses on making the site more useful and intuitive. The new navigation bar on every page. This should be a big improvement over our old site, making it much easier and intuitive to use the oral arguments, judges, and visualizations sections of CourtListener. 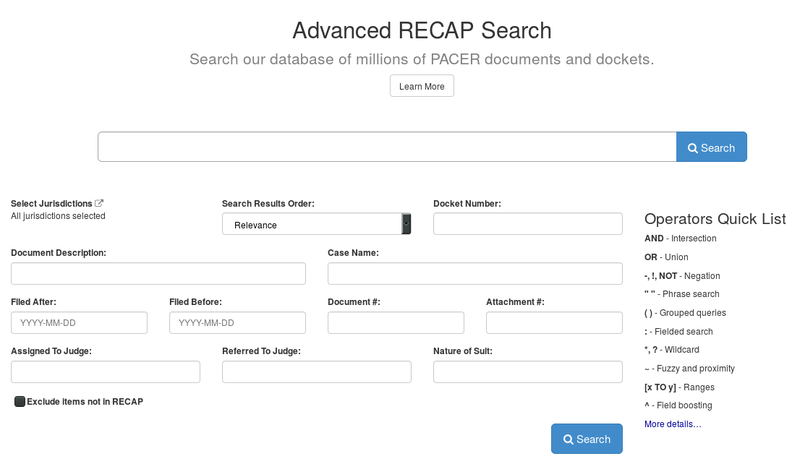 The new judicial advanced search page. 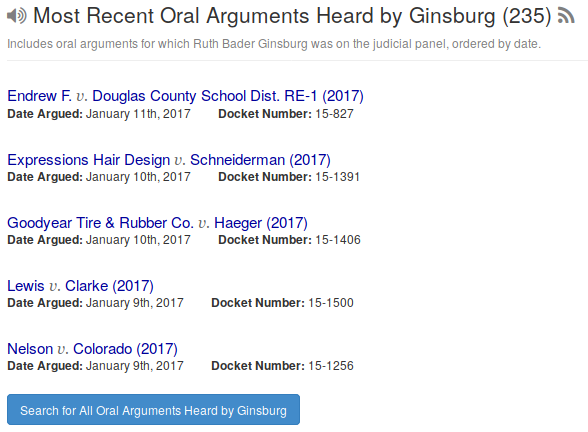 This page should make it much easier to understand and query our judge database, and we expect the pages for advanced oral argument search and advanced opinion search will be similarly valuable. The final enhancement we’re excited about is a layer of polish across the entire site. This cleans up some old issues, adds explanations to areas that were somewhat unclear before, and makes the site more accessible to people with certain physical disabilities. We’re proud to share that as of today we’ve added campaign finance data to our database of judges. This update links judges in the CourtListener system to their fundraising profiles in the FollowTheMoney.org database, allowing researchers and members of the public a new way to understand judges elected in State Supreme Court jurisdictions. This work was made possible by a prototype grant from the John S. and James L. Knight Foundation. Using this system, you can easily see the sources of money that a judge received as part of an election, and you can put it side by side with all of the data that we have already gathered about that judge, such as the decisions they’ve written, the positions they’ve held professionally and in the judiciary, and their biographical information. Tom Parker has raised approximately $2.1M dollars. This listing provides the five most important opinions by the judge, and you can click the button at the bottom to see all of the cases they wrote or participated in. 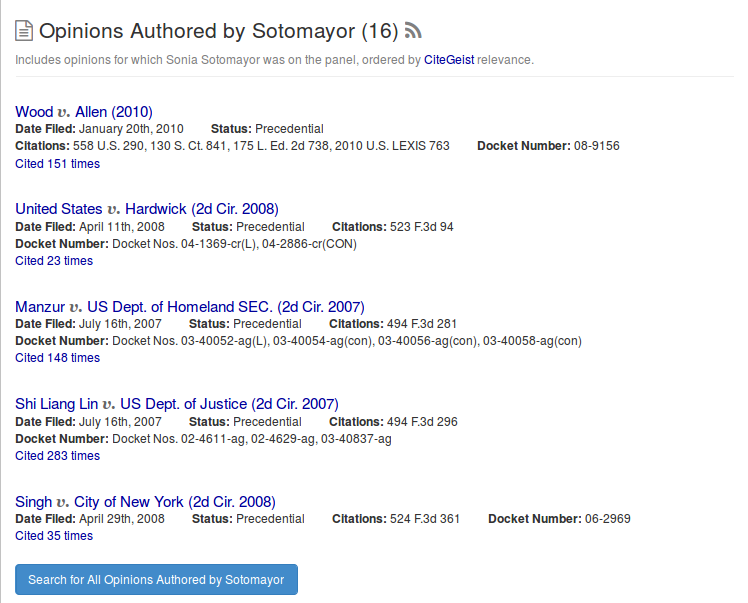 Clicking the button takes you to our search results, where you can slice and dice the data, choosing, for example, to see only their opinions from the Second Circuit, or their Supreme Court Cases. In the search results and in the list on the judge profile page, the opinions are ordered by relevance, using our CiteGeist relevance engine. 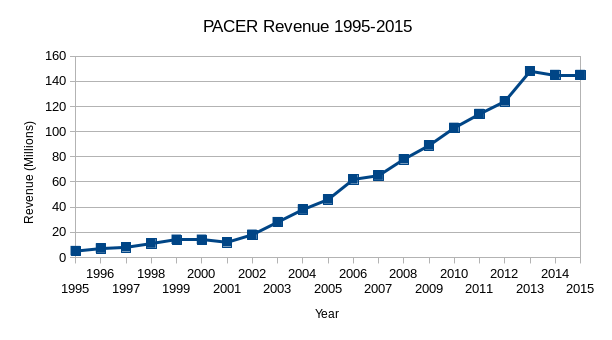 This highlights the cases that have been cited the most frequently by the most important cases. This brings the number of jurisdictions to more than 400, and it is getting hard to tell which courts are important. For example, some of the courts above have been terminated, and the King’s Bench is actually an English jurisdiction—-or was, until it was terminated in 1873. 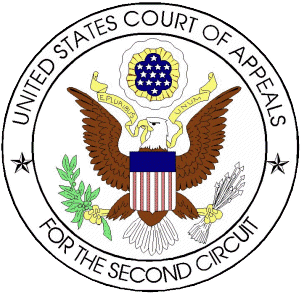 At its quarterly meeting on May 23, 2016, the judges of the United States Court of Appeals for the Second Circuit approved the posting of audio recordings of oral arguments to the Court’s website, commencing August 15, 2016, the first day of the 2016 Term. A few months ago, we calculated that this content would cost $300,000 to purchase, so this is great news for historians, scholars, legal practitioners, and everybody in between. Last week was a busy one for Free Law Project. While I was at the LTDCA conference in San Diego, presenting on our database of judges, Colin Starger of University of Baltimore School of Law was at the annual CALI conference talking about our new Supreme Court citation visualizations. While my talk wasn’t recorded, Colin’s was, and you can watch it now. He’s also got a great post on his blog that has lots more information about the talk and his process. Both are a great way to get started with our Supreme Court visualizations. Enjoy! About half of the episodes of General Hospital! Listening to lawyers argue for this much time is not recommended, but we’ve seen demand for this material and we’re very pleased to offer it as oral argument podcasts or directly on CourtListener.com.